Army Sgt. Bowe Bergdahl Is Charged With Desertion : The Two-Way Bergdahl was released by the Taliban in exchange for five detainees at the Guantanamo Bay prison. He was captured in 2009 after walking off his post in Afghanistan. Army Sgt. Bowe Bergdahl has been charged with desertion and misbehavior before the enemy. This photo provided by Eugene R. Fidell shows Sgt. 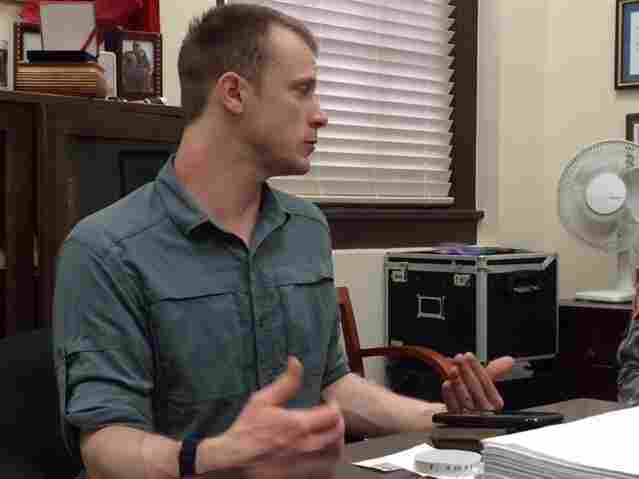 Bowe Bergdahl preparing to be interviewed by Army investigators in August. Bergdahl was captured by the Taliban in 2009, after he walked off his military outpost in southeastern Afghanistan. In a controversial move and five years after his capture, the Obama administration cut a deal with the Taliban, securing Bergdahl's release in exchange for the release of five Taliban detainees who were being held at the Guantanamo Bay prison in Cuba. In December, the Pentagon referred Bergdahl's case to an Army general, who would determine whether he should be charged. There will be an Article 32 hearing on April 22 at Fort Sam Houston to "decide if there's probable cause" to begin court-martial proceedings. The closest analog to that hearing in the civilian system is a grand jury investigation. The desertion charge carries a maximum penalty of five years in confinement, and misbehavior before the enemy carries a maximum charge of life in confinement. Bergdahl's lawyer, Eugene Fidell, told NPR that he did not know whether the military would take Berghdahl's time in captivity into account before handing down any decision about his client. "I assume that anyone in a position of responsibility would understand that is an important mitigating factor," Fidell said. The deal for Bergdahl's return was controversial politically, because the circumstances surrounding his disappearance have always been murky. As we've reported: Some accounts had him captured during an attack on his post; others put him walking off his outpost during a counterinsurgency mission. An account in Rolling Stone implied that Bergdahl was "ashamed to even be American" and was defecting when he was captured. Because of that, lawmakers criticized the Obama administration for cutting a deal with the Taliban. The Government Accountability Office later found that the Pentagon broke the law during the course of the trade. As we reported, first, the GAO found that the "Pentagon violated the Department of Defense Appropriations Act when it didn't give 30 days' notice to Congress about its plan to move the five Taliban prisoners from Guantanamo Bay." And second, the $1 million used for the transfer "was paid for out of an account of already-appropriated funds — a violation of the Antideficiency Act." In a press conference Wednesday, Col. Daniel King announced the two charges being brought against Bergdahl, under the Uniform Code of Military Justice. The first is Article 85 Desertion and the second is Article 99 Misbehavior before the enemy. The description for the Article 99 charge is broad and can include running away in the presence of the enemy and being "guilty of cowardly conduct." King said the next step is an Article 32 hearing, a kind of investigation that determines whether there is enough evidence to warrant a court-martial.